When tornado-strength thunderstorm winds batter the Texas Hill Country, massive live oak trees that have stood for hundreds of years uproot and topple. Here in the Black Isle of Scotland, gale force winds sweep from coast to coast constantly – seldom uprooting or toppling trees. Duress has provided the impetus compelling Scottish trees to grow into defiant survivors impervious to life’s storms. Scottish trees stand intransigent and victorious, feeding on the fury of the wind to send roots deeper into the soil. That’s a good illustration for the New Year. Welcome life’s storms as challenges forcing growth and change. Storms may seem like furious, unrelenting events over which we have no power, and which will rob us of victory or success, but the power of life’s storms and our resulting defeat are both illusions. The world has coined two clichés: what doesn’t make you bitter makes you better and what doesn’t kill you makes you stronger. Storms have peppered my life over the years. As a child, I lived in a cowshed with no indoor plumbing facilities. After escaping childhood sexual abuse and two forced non-medically supervised abortions that nearly killed me, I lived under a bridge. As a single parent, I worked two and three jobs to make ends meet and slept in the back of a pickup truck on top of our belongings when moving from job to job. I spent over a year in an open-ended garden center with no indoor plumbing, bathroom or kitchen facilities, and wildlife coming in and out freely. I had my property stolen by underhanded legal proceedings. All on the same day; our sheepdog died, my mother died and I couldn’t attend her funeral because my husband was sent home in an ambulance to die, and my truck caught on fire in downtown San Antonio. Just over a month ago, I lost my only son in a plane crash. No one is immune to storms. We have two choices when storms hit us; suffer and grow bitter, or grow and become stronger. Storms have strengthened my writing, too. From the time I was eleven, all I’ve wanted to do is write. Fifty years of rejection slips, disappointments and closed doors have strengthened my resolve into a wall that simply can’t be battered down. I’m thankful to have six published mystery-romance-suspense books, but even if I had never had one book published or one copy sold – I would keep writing. Storms have driven my writing roots so deep that they can’t be uprooted. May your 2014 be full of calm, peace, love and joy and as few storms as possible. Should a storm find you in 2014, embrace it as an opportunity to grow stronger roots. My prayer for you: “That God would grant you according to the riches of His glory, to be strengthened with might by His Spirit in your inner parts.” Ephesians 3:16. 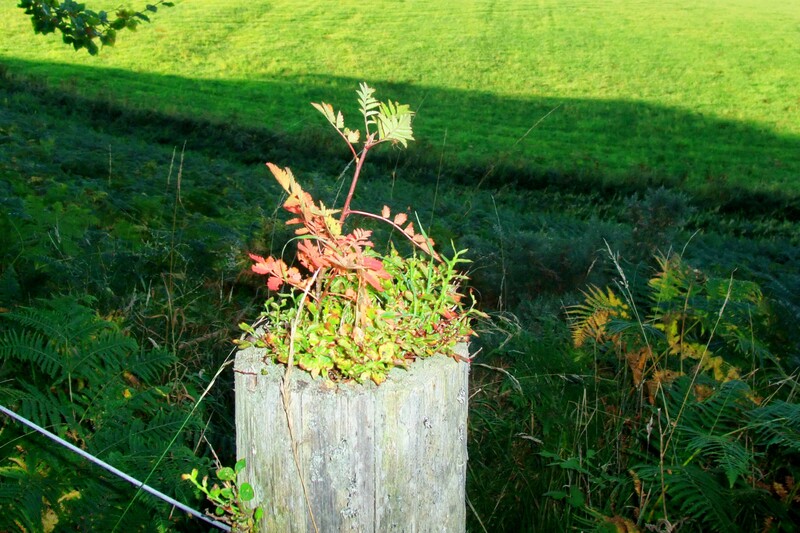 When I feel faint, I look again at this picture of a little tree determinedly growing out of the top of a fence post. If it can bloom where God has planted it, so can I! Posted on December 31, 2013 by authorstephanieparkermckean •	This entry was posted in Uncategorized and tagged 2014, Bible, bloom, god, mystery-romance-suspense books, New Year, Scottish, storms, Texas Hill Country, trees, writing. Bookmark the permalink.